Finding a good vegan muffin recipe is not as hard as it may seem. In fact, you don't even need to go digging for specialty vegan recipes at all, since there are so many ways to convert your favorite conventional muffin recipes into vegan masterpieces. The trick is finding ingredients to substitute for dairy and eggs. The Internet is brimming with mouthwatering muffin recipes designed especially for vegans. 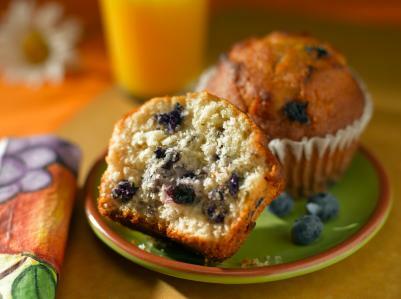 With resources like EgglessCooking.com, finding a tasty egg- and dairy-free muffin recipe is a cinch. What's more, not only are the recipes divinely delicious, they are also good for you. Since most of the muffin recipes are low-fat and low-cholesterol, they appeal to a wide array of healthy eaters who span far beyond strict vegans. In a medium bowl, combine the flours, baking soda, salt, and lemon zest. In a large bowl, combine the sugar, milk, oil, vanilla, and vinegar. Mix well. Fill the muffin tins about two-thirds full. Bake about 20 minutes, until a toothpick inserted into the center of a muffin comes out clean. Remove muffins from the oven and let them cool for a few minutes before serving. Vegan muffin recipes are healthy alternatives to traditional baked goods. However, if you are converting traditional muffin recipes to make them vegan-friendly, keep in mind you may need to make a lot of changes. For example, it's a good idea to bake vegan muffins a few minutes longer than you would regular muffins due to the extra-moist nature of vegan substitutes. Don't be afraid to experiment with additions as well. Dry coconut flakes and almond meal are great add-ins to vegan-friendly muffin recipes that are on the soupy side. In most cases, you will find vegan muffins moister than traditional versions. Consequently, it pays to taste as you go to make sure your recipe turns out to your liking. Another option is to dry fresh fruit before adding it to your muffin recipe; extra moisture from fresh or frozen blueberries or strawberries may cause your muffins to collapse. To prevent that from happening, simply give the fruit an extra pat or two with a dishcloth or paper towel before adding it to the batter and baking.